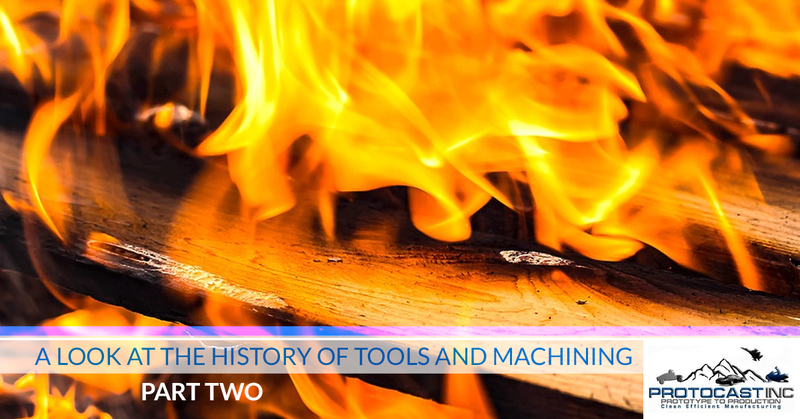 If you’ve followed our recent blog posts here at Protocast Inc., then you’ll know that we’ve recently touched on the early history of tools and human civilization. Again, while historians dedicate their entire professional lives studying such a thing in detail, it’s nice to touch on the historical highlights of such an important development in human history that literally shaped society and civilization into what it is today. There’s no doubt that humans have come a long way from just throwing rocks at objects to engineering complex tool cutting systems like you’ll see at Protocast Inc., but we think that it’s important to touch base with our industry’s roots, too. That’s why we’re going to continue looking at the early history of tools and humans. For modern, cutting-edge (again, literally) tool cutting services at our Denver machine shop, Protocast Inc. can handle the exact specifications of whatever your metal casting or prototyping needs are. Learn more about our services here. Applying heat to tooling pretty much changed just about everything. As far as 1.5 million years ago, the earliest fire may have been started by East African hominins (Homo ergaster). The fact that fire could cook meats to suitable temperatures for consumption and digestion spurred massive growth in human cognitive developments. Fire could also be used as a weapon as well as a…surefire way to manipulate objects and items, like metal, for instance. However, weapons like swords did not come about for some time after. At this point – only a mere 400,000 years ago (a microscopic blip in time when it comes to the geological timescale, at least) – the “Schöningen Spears” in Germany were created. This meant that mankind could have an easier and more effective way to hunt prey – and hey, with fire being a well-established thing, early humans were probably pretty seasoned at cooking by this point. 30,000 years ago marked a great turning point for mankind. The first domestication of dogs is thought to have begun at about this time. Essentially, this marked the beginning of the human use of living tools which continued into the Agricultural Revolution and the progressive domestication of plants and other animals. Arguably one of humankind’s greatest inventions – the ability to manipulate and control animals around them (instead of being prey to dogs) largely contributed to the civilization of humans. 12,000 years may represent many human lifetimes, but in a historical context, it doesn’t sound like that much time. Yet, the first use of genuine metal implements isn’t recorded until around this time. When we consider a more conventional outlook on the concept of tools, this is where these handy objects really start coming into play with the common use of things like axes, spears, and more. By inventing and improving tools over time, ancient humans were able to accomplish tasks that ordinary human bodies could not, such as using a spear or bow and arrow to kill prey. What was once an issue of pure survival against other animals became a matter of what humans wanted to eat, and from there, mankind had more time for other matters such as intellectual development, the arts, and so forth. More knowledge eventually led to the invention of mechanical devices in Ancient Greece and Ancient Rome, and more time, mechanical devices led to machine tools. We hate to cut this tool-fueled history lesson short, but as we mentioned above, we’re no scholars. Protocast Inc. does employ the latest CNC machining technology and other machine cutting standards to stay on top of the latest tool cutting processes, however. If you need tools cut from our Denver machine shop, don’t hesitate to contact us today.